First, off all let’s start with what is free riding; free riding is a style that is very well defined by riding lots of hills and sliding you’re board a lot. You might be doing a lot of standup slides, 180s, switch slides or maybe slashing some driveways, drifting around corners but you also need to blend a lot of styles of different types of ridings like freestyle or down hills. There are lots of different boards that are really good for this style of riding. So let’s just jump straight into a few examples of such boards and let’s see what makes them good boards for freeriding. 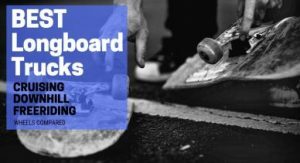 Also if you don’t know the difference between a downhill and a freeride longboard then checkout out our recently published Best Downhill Longboards Guide. 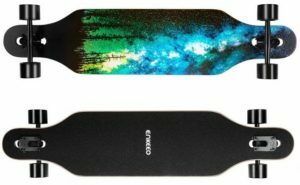 With that said, let’s take a look at feature overview of Top 3 Best Longboards for Sliding and Freeriding. In this section, I’ll be going through each, and every freeride longboard that I have mentioned earlier in the intro and will talk about their pros and cons and their features too. 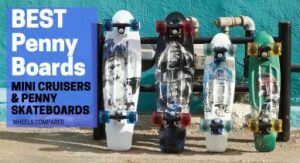 So stay tuned, also if you are in some kind of a hurry then jump straight to freeride longboard’s Comparison Table and Buyer’s Guide. The first freeride longboard on our list is from Santa Cruz. If you are a longboard enthusiast and don’t know about Santa Cruz, then you might have been living in a cave or something. Known for their dedication towards perfection to bring you the perfect board and impressive artwork that goes into making! Santa Cruz deserves every single ounce of appreciation that they can get. Basically, it’s a cruiser longboard, that’s what we call it! But it does have some features that allow you to get a little bit more aggressive with your riding style. So if you wanna get into some freeriding and cruising then definitely it is a good entry-level freeriding longboard. It all starts with Santa Cruz’s cold pressed 9-ply deck construction which is 100% hard rock maple. So its 40 inches long and 10 inches wide with a wheelbase of 31 inches. Also, it has a rocker profile like a banana with some concavity to lock your foot in just so you can get a little more aggressive with your free riding. You’ve got Road Rider 180mm drop-through mounted trucks. So it keeps you lower to the ground and makes it easier for you to push out. The board comes in with OJ Thunder Juice 75mm, 78A wheels with some basic bullet ABEC-3 bearings. So, if you are looking for something that can take everything that you throw at it, then this setup from Santa Cruz is perfect. Also, if you want to take your sliding to the next level then you do need to upgrade your standard OJ Thunder Juice wheels with some softer round lip wheels; just so you can get that sideways push out slides. Also, the Road Rider trucks are gonna make you a lot more stable. So, it’s a pretty fun entry-level cruiser that lets you enjoy that aggressive freeriding experience and what’s even better is, it’s from Santa Cruz. Next up on the list is the Aperture freeride complete longboard from Sector 9. 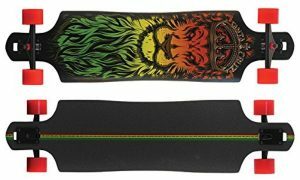 This board is an absolute beast when it comes to maximizing your performance, and it is capable of satisfying your all kinds of freeriding needs. In short, all I can say is that it’s the best longboard when it comes to turning on a dime and wrapping around the corners with ease. It is highly responsive and gives you all the control that you need underneath your feet. The Sector 9 Aperture Sidewinder 36 –inch longboard is a drop through mount longboard meaning that the sidewinder trucks actually kind of grump through to the top of the board. As opposed to mounting on the bottom of the board the trucks on this board are not completely flush with the board. So it’s not a flush mount but just a drop-through mount. Sector 9 Aperture deck is made from 8-ply Canadian hard rock maple. The board has just a little bit of flex in it, but it’s not like some of the cosmic series boards that have fiberglass in it. The deck is 36 inches long and is 9 inches in width. So, you’ve got a nice wide platform to perform any kind of freeriding trick. With Gullwing Sidewinder trucks the Aperture has a unique truck system, which has two kingpins that allow your trucks to turn and then kind of engage a second time to give you a really quick and tight sharp turn. So, bet me that’s really sweet when you are into freeriding. You’ve got 69mm, 80A 9-BALLS wheels which are going to be a little bit thicker. So when you are making those quick turns, you aren’t sliding around, and it gives you tons of grip. Along with that you’ve got ABEC-5 bearings from Sector 9. With that said that’s pretty much it when it comes to the construction or build of the Sector 9’s Aperture. This board is going to be great for finding those hills to bomb down or to cruise down because it has these Sidewinder trucks that can make quick and tight turns. You can commute, you can get to places, but there are other boards that are better for that. Again, finding a hill and jumping on this board makes it super fun to ride with the greatest ease. So, I’ll definitely suggest this to anyone looking to take their freeriding to the next level and what makes it better is that it will last years and years of fun riding. Next up on the list is a more affordable option when it comes to freeriding longboards. Also as we are moving down the list, we will be reviewing the more affordable ones. 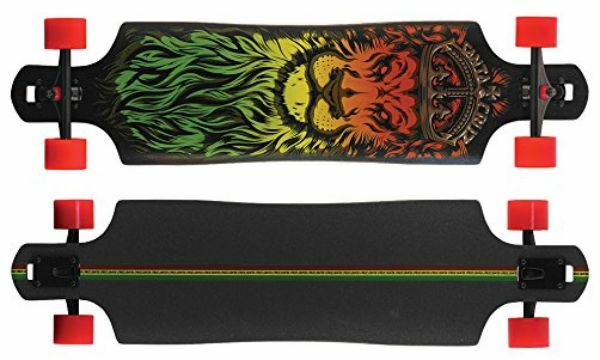 So this board from Minority will cost you somewhere around $50 or less, which is quite impressive when you compare it with the Santa Cruz Loin God Rasta and Sector 9 Aperture that costs around $100 to $200. Also, it’s the more stable of the two as it comes with a drop deck configuration. So, value for money is INSANE here! Everything on the Minority freeride downhill longboard starts with the 8-ply of hard rock maple, cold pressed into the other to create a stiff and sturdy board. Also, another thing that I’d like to add is that its 100% Canadian maple wood. So it’s the highest quality of deck that you can get in this price range. The trucks are paired with 70mm, 78a PU wheels with ABEC-9 bearings. Both the bearings and the wheels make the board quite smooth and incredibly fast which enables you to enjoy an unsurpassed smooth ride. 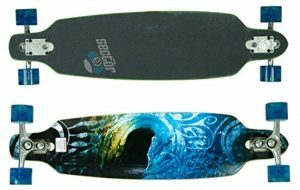 Also, it’s quite a big board with a spacious deck of 10 inches and with a wheelbase of 37 inches that adds to the stability of the board. That’s all with this classic drop deck downhill freeride board. Another thing to add is that the board is perfect for beginner riders as it offers a lot more pockets for your foot. Foot pockets really come in handy as you exactly know where your foot is on the board and where you want them to be. Overall it’s a really good entry-level freeride longboard, and you’ll be amazed to see how good this longboard is when it comes to the context of freeriding and sliding. Also with the horizontal drop, there is something to wedge your foot onto so there is no chance of your board slipping out from beneath you. 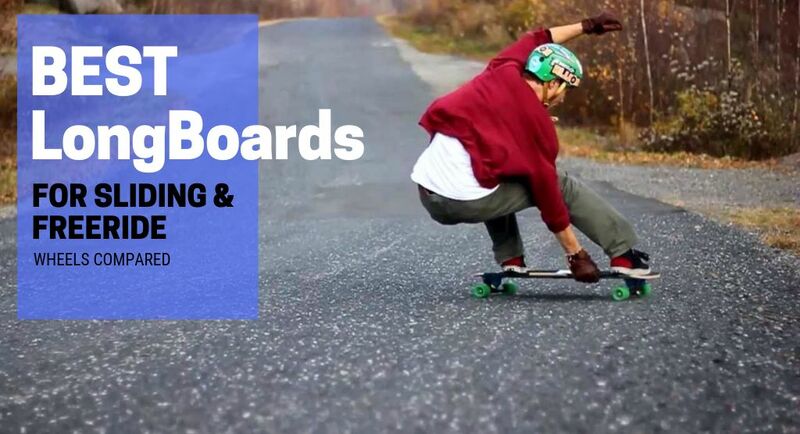 I’ll definitely suggest you look into this board if you are a beginner as it will give you a perfect platform to grow and enhance your freeriding skills. Let’s get started with the shape of your board. Generally, in free riding, you would be doing a fair amount of switch riding. So you typically are going to want something which is symmetrical. Having a symmetrical board really helps because if you’re doing a lot of 180s and riding switch you’re gonna need a board that doesn’t make you feel backwards when you are backward, it has to feel the same both ways. Also, a symmetrical board is going to help you a lot when you are doing those switch maneuvers which are a lot more difficult, so your board isn’t holding you back in any sort of way. In short, a symmetrical board will make sure you feel comfortable and safe whatever the riding style or riding position. Another main feature you’re gonna want in your freeride longboard is a deck which is fairly stiff. A board with a little bit of flex is okay, but you need something quite a bit stiffer than your average freestyle deck. That’s because you’ll definitely be going a lot faster and you want something more stable. So, typically a 9-ply board or a board with composite fiberglass and maple are good choices because these will make it stiffer and a little bit lighter too. Also, note that the fiberglass decks are a bit lighter than your typical maple wood decks. So, better look out for them! The wheelbase is another thing you need to look out. You’re gonna want some kind of a medium wheelbase, a wheelbase longer than your typical freestyle deck but somewhere between 20 to 30 inches is a pretty good rule of thumb. Moreover, it’s quite fun to freeride those small wheelbases as well. So, keep your options open and don’t get too hung up on how big and what size these boards should be. 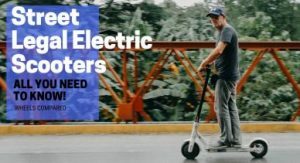 A lot of people are more recently riding something that’s more similar to your regular skateboard, and that is just a little bit longer and a little bit wider, so you get more foot space. 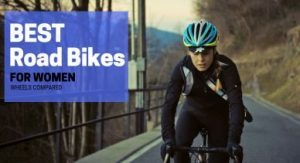 This is where you can really blend a lot of styles; more of street style or freestyle kind of styles with it as you’re going down hills with a nice short playful wheelbase. You are really going to enjoy riding these kinds of skateboards for all different types of riding. 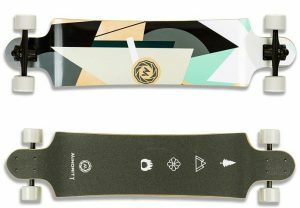 The other main feature that you’ll need with freeride longboards is that they all tend to have some sort of pocket for your foot. This is accomplished in quite a few different ways, and we can start off with a more traditional drop deck longboard. It’s going to be horizontally dropped all the way down so what that does is that it gives you a platform that is a little lower to the ground. Also, it’s going to make you more stable but what more it does is that it creates a great little pocket area for your foot so you can wedge your foot in there. Another good thing about a drop deck is that you always know where your foot is, your feet don’t get lost on the deck, and when you slide, your foot is much less likely to slide around and get out of place hence, avoiding getting you into bad situations. So it’s quite good to have these kinds of pockets on your freeride longboard. Another one that you can look for is something like a board that has drop-through mounting, and again this is something that’s gonna get you lower to the ground. It will give you a lower center of gravity, so it’s more stable. But the biggest thing in the context of free riding and sliding is that it’s gonna give you low leverage on the board because the base plate sits on top and you’re going to get more of lateral leverage on your wheels and your trucks. It might not give you much grip, so you’re not going to grip around corners much well, but if you just want to spin around and do your stand up slides, then this is a really good option. Also, this feature is great for beginners for these reasons. Moving onto a board that has somewhat of a drop that is very minimal or what people call ‘’a radial drop’’. In this kind of configuration, it’s arched like this so that it’s more ergonomic for your foot. It will act more as a foot stop this way so your front foot isn’t going to be sliding backward and this will keep you in place. Also, it’s gonna be a little more comfortable for your foot. Next up is a board with a technically drop deck but with more of a micro drop which good for sliding and freeriding as it’s going to act as a geographical locator for your foot. Again it’s just like the other freeride boards and is mainly to help your board from slipping you out, so you have something to wedge your toe into when you’re doing your toe slides. Also, a board that has rocker profile, instead of a camber shape is just another thing to make you feel a little more comfortable as it helps lock you in a little more ergonomic shape in the way your body will sit on the board. 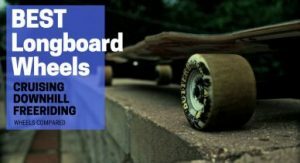 So there you are, and these are the things that you should definitely look into when buying a longboard for freeriding. With that said let’s wrap some things up with the key features that you should be looking in a good freeride longboard. It’s going to be! Some sort of foot pockets. But again there are a lot of people who ride very flat planks for this sort of riding as well. So it’s all up to personal preference and what you want to see in the board. Also with freeride and downhill; there’s a lot of crossover with styles. 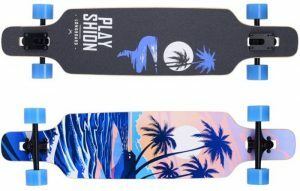 So a lot of people are going to be riding the same board for both sorts of riding; most freeride boards are good for downhill riding, and almost all downhill boards are also gonna be good for freeriding. My final advice for you would be just to go out there and enjoy and don’t get too confused with all the features and all that you need in your longboard. Instead, think of it as an opportunity to find a longboard for freeriding that’s not a cookie product, but it’s your opportunity to find something that is tailored for you and how you ride.